‘Wacky’ is a particularly ugly word when considering the merits of a comedy film. Much like it’s sinister cousin ‘suspense’, it’s an adjective which has become detrimental to itself, leaving one to assume that something regarded as ‘wacky’ is, by it’s very nature, anything but. This is a major problem not only when marketing films, but also reviewing them. 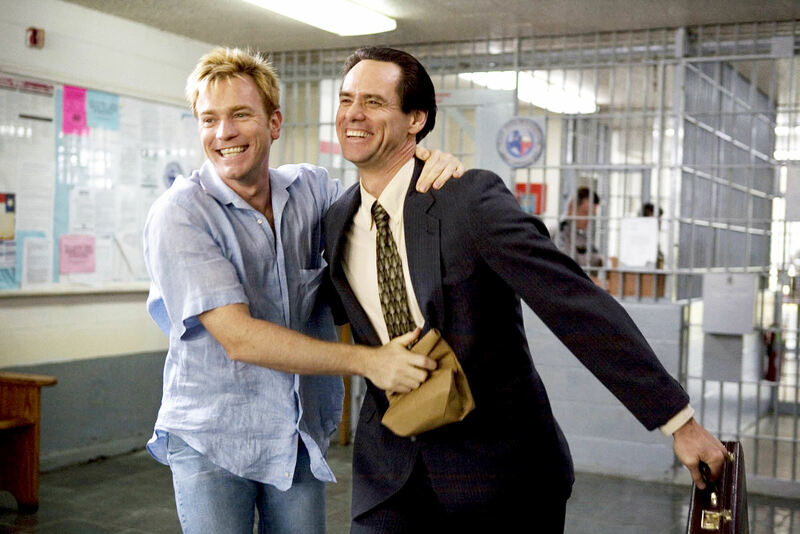 I Love You, Phillip Morris is a ‘wacky’ film, but it’s all the better for it! Staring death in the face after a car accident, Virginian cop Steven Russell (emblematised by Jim Carrey) decides to break the social taboos and step out of the closet. Leaving his job, wife and kid behind, he uses his gift of the gab to become a full-time con artist as a means of affording the gay life of luxury he has longed for. Caught in the act, he leaves behind the, fast cars, dazzling clothes and questionable sun tans for a cosy prison cell, where by chance he meets the love of his life, the sensitive inmate Phillip Morris (a highlighted, comfortably camp Ewan McGregor). Assuring Phillip that ‘everything is gonna be ok’, Steven is in and out of the prison like clockwork, trying to scam up enough money for the two to unite beyond the prison bars and live happily ever after. What is so fantastic about Glenn Ficarra and John Requa’s offbeat comedy is that it deals with the gay relationship at it’s centre so tender and nonchalantly that it is devoid from any sense of wackiness. Instead, the filmmaking pair provide a sour witted script which enables their central actors’ talents to give their best performances in years. For Carrey, he is able to meddle together his libido and rubber faced tendencies to spectacularly camp and incorrigibly corrupt effect, and McGregor is mesmerising as the virtuously poised Bonnie to his Clyde. Losing grip of it’s preposterously funny subject in the final thirty minutes, I Love You, Phillip Morris is nevertheless a ride worth experiencing. Trashy, corny and – you’ve guessed it – wacky, but what else would you expect from this extraordinary, stranger than fiction tale? This entry was posted in ★★★★☆ (4) and tagged Bad Santa, Comedy, Crazy Stupid Love, Ewan McGregor, Glenn Ficarra, I Love You Phillip Morris, Jim Carrey, John Requa, Leslie Mann, Sundance, True story, Velvet goldmine. Bookmark the permalink.